Portsmouth have made an approach for Oxford United manager Chris Wilder. League Two leaders Oxford's chairman Ian Lenagan would not confirm if Portsmouth had made an official approach, but said he was not concerned by any interest in the 46-year-old. "The fact that one club, who are a failing club, comes in for him. That tells you he is a good manager," Lenagan told BBC Radio Oxford. "Chris Wilder has showed his commitment to Oxford over five years. "Am I concerned about Portsmouth? I am not concerned about Portsmouth at all. 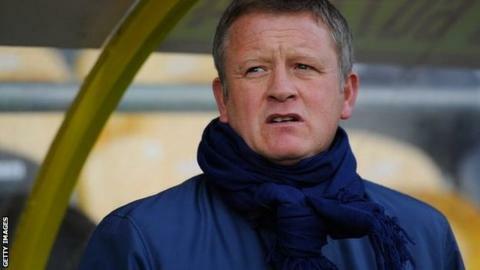 "I think anyone would be interested in Chris Wilder. Who wouldn't be interested in a manager who is top of the league? "This is a man who has been castigated as not being good enough for Oxford United. I think it is delightful that a club wants Chris Wilder. I take great delight in that fact. I wouldn't want him to go, he has a contract with us." Oxford currently sit top of League Two, while Pompey are in 17th position and their chief executive Mark Catlin refused to comment on the speculation. "We don't want to comment on any manager, or a manager who is at another club," Catlin said. "We are going through a process, we have approached a number of clubs to see if they would be willing to allow us to talk to their manager. "Whatever we do, we want to do it via the correct and appropriate channels." Speaking on Thursday, Wilder would not be drawn on speculation linking him to Portsmouth. "I've been in the game long enough to know you've got to keep your head down and focus," Wilder said. "Success can sometimes turn your head and allow you to lose focus. As always, where would you rather be, at the bottom of the league and everyone thinking you are useless? Or people talking about you in a positive way?"